At Brandt, we work to keep our eye on your final operational goals throughout every step of design, construction, and the building commissioning processes. 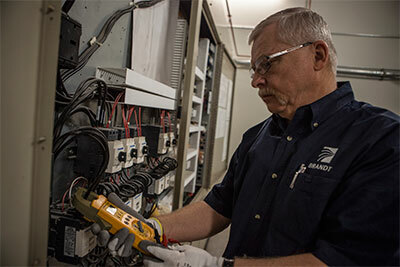 From beginning to end we work to make sure your installation performs within compliance standards that maximizes operational success. Our commissioning success rate is one of the highest in the industry thanks to our attention to detail during each phase of your project. Pre-Commissioning Review: We go over project documentation to ensure the design and construction meets specific codes and standards. Building Automation System Review: All aspects of control systems are designed so your systems perform to optimal sequences of operation that maximize efficiency. Construction Support: During the construction process, we perform jobsite observations; generate an issues log; and complete our commissioning plan according to NEBB standards. Field Installation: We use Field Verification forms to ensure the installation is completed correctly. Functional Performance Testing (FPT) and Operational Performance Testing (OPT): We validate the full operational status of equipment and systems. FTP forms verify all aspects of the system are performing to design specifications. Our building commissioning and control systems commissioning processes are based on transparency and communication, so you have a full understanding of Brandt’s installed work. We encourage communication between all of the installing trades, the owner’s staff, and the design team—when the owner understands the process and the final system, they are most likely to succeed in getting maximum utility from the new installation. And when our clients succeed, Brandt succeeds.